You have probably seen them: in the workplace, at your college, in the airport, or maybe even at the hospital. Security guards are often hired from outside companies and private security contractors, like Frederick Asset Protection. As such, they are often overlooked, performing their duties in the background so their client can continue business as usual. When their work does involve screening and recording client activity, some even make the mistake of resenting the presence of security guards as an unnecessary hassle or formality. But what do these security guards actually do for their clients? How does their presence contribute to a safer work environment? Here are 10 major responsibilities which security guards perform for most of their clients which often go unnoticed. 1. Protect property and personnel by patrolling and keeping an eye out. This is the chief responsibility of all security guards. They are hired to serve as the eyes and ears of their company, watching out for suspicious behavior, unauthorized entries, and unrecognized vehicles and packages. Patrols are the chief method of doing this, and may include indoor and outdoor examinations either on foot or in a vehicle. While modern closed circuit television (CCTV) cameras allow security guards to monitor much of the client’s property, this is no replacement for physical patrols, which can catch many things a camera would not. 2. Monitor all gates and entrances to the property. Closing and opening gates at certain hours. Responding to gate intercoms or requests to enter. Recording make, model, and sometimes license plate numbers of vehicles entering the property. 3. Regularly examine locks, gates, and other security features. Often a part of the regular property patrols, security guards are expected to check all locks, gates, fences, and security systems. Sometimes a careless employee may leave a gate unlocked or not shut a door all the way. Security guards must catch this and secure those offices and entryways. Fencing can sometimes be damaged by weather and age, and sometimes it is intentionally damaged by those seeking to enter the property. Security guards must constantly be on the lookout for loose gate posts, cut wire links, bends, and holes in or under the gates. Furthermore, all security alarms, sensors, and cameras must be regularly examined to make sure they are functioning properly. 4. Identify visitors, ask for documents, and record time in and out. Security guards are often expected to record all incoming and outgoing visitors, and sometimes even employees. Visitors may be required to present documentation or a pass to gain entry, and may be required to write down their time of entry and exit from the property. 5. Monitor all surveillance systems and video feeds. Surveillance systems, alarms, and CCTV cameras make modern security much tighter and provide an invaluable tool to security guards. While large teams of security guards were formerly needed to constantly patrol large properties, modern CCTV cameras may now allow a single security guard to monitor dozens of different areas without ever leaving the guard house. 6. Respond to all alarms and emergency situations. Security guards are heavily trained to respond to various alarms and security situations. They are the first responder on every scene for the client, and it is their responsibility to ensure that evacuation and relocation procedures go according to plan and protocol. They are responsible for checking that all employees are out of the building safely in the event of a fire, chemical leak, or other accident. 7. Contacting the proper authorities in the case of theft or emergency. Security guards often keep records of contact number for local police, fire department, and emergency medical services. It is their responsibility to discern which authorities need to be called and when. As a security guard may only be able to make a citizen’s arrest, the assistance of the police may occasionally be required. 8. Issuing tickets and citations. Some security guards are also responsible for maintaining the client’s rules, which may involve writing tickets and citations. 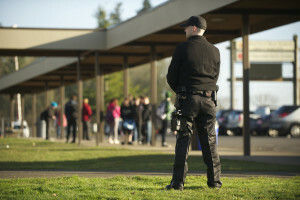 Security guards on a college campus, for example, are responsible for ensuring that traffic laws are obeyed on the campus property and that cars are not illegally parked. Other times, a security guard may be responsible for writing an infraction for an employee violating the company’s rules. 9. Filing regular and complete reports. Security guards are responsible for keeping regular records and reports. These reports help the client to keep track of security incidents and also protects both the client and the security company in the case of a lawsuit. 10. Monitoring phones and forwarding calls. As security guards usually work around the clock to protect the client property, they are often delegated the responsibility of receiving phone calls after hours for the client. These phone calls may include client call-offs and other callers whom security is responsible for recording and forwarding to the correct numbers. Security guards perform many services for their clients, which although often overlooked, make business, plants, and schools much safer places to work and study. While not all security contractors offer a satisfaction guarantee, which makes companies such as Frederick Asset Protection such a valuable security solution. Our Services, Frederick Asset Protection.